← They have good food in Italy. 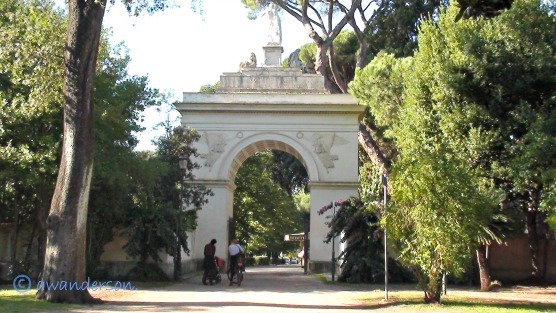 If you have read any of my previous posts you know that when I visit a large touristy city I always like to seek out a nice Park-Villa Borghese is my choice in Rome. I visit a park when I need a quiet break away from the hustle and bustle. 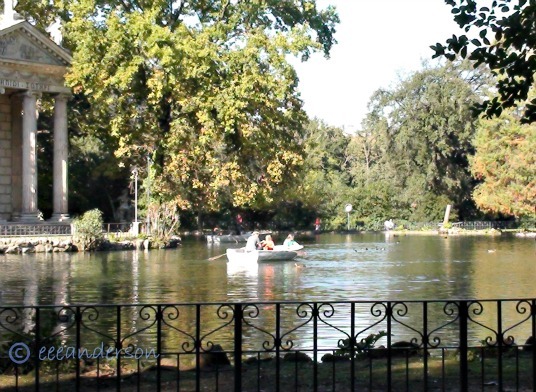 Villa Borghese is a large beautiful quiet park, easy to reach on public transportation. I sometimes have trouble climbing up stairs so I take the bus to the Santa Maria del Popolo entrance. The bus goes through the arch and I get out at the first main street inside the park and spend the day walking through it-coming out at the top of the Spanish steps. It is much easier to walk down. 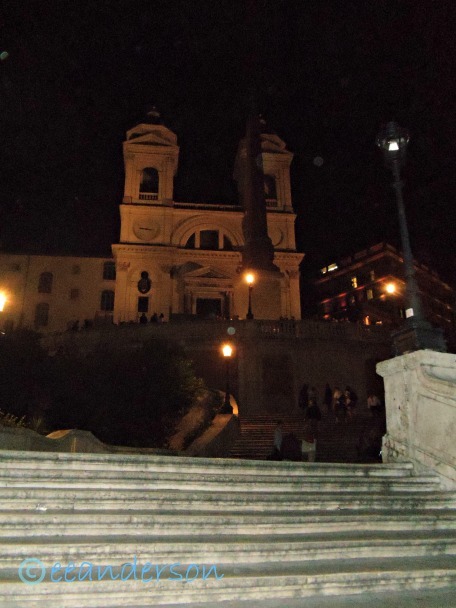 At the bottom of the Spanish steps is the piazza di Spagna and access to transportation. 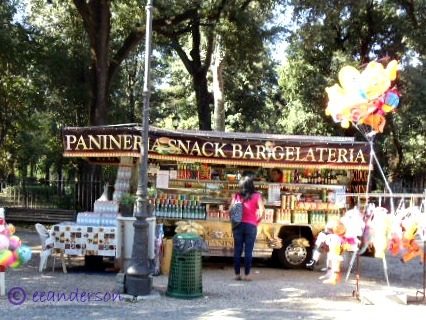 The metro Spagna is near there – we stayed in Trastevere on this trip so we took the bus. The park reminds me of a modern albeit a very upscale subdivision. 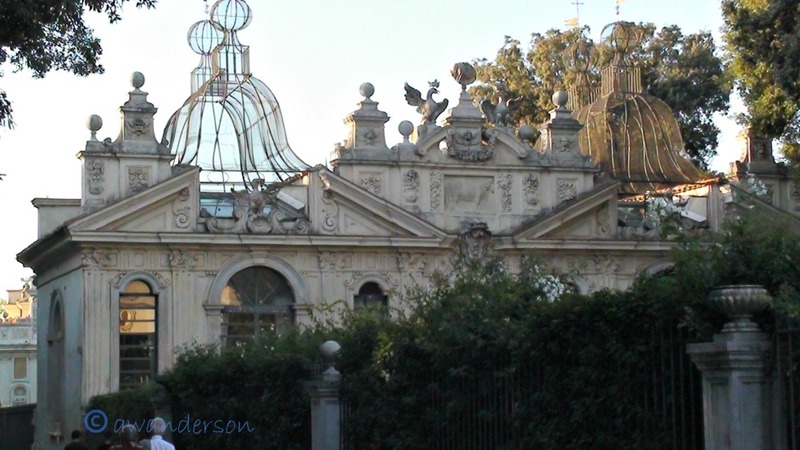 It is filled with luxury villas that were built originally as homes for the aristocracy. 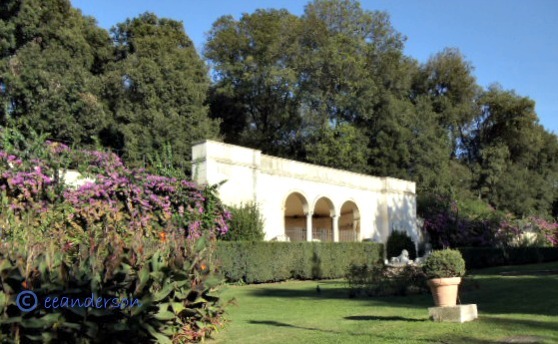 The grounds of these villas and public spaces are filled with beautiful gardens, fountains and statues of famous poets, writers, artists, philosophers and politicians. 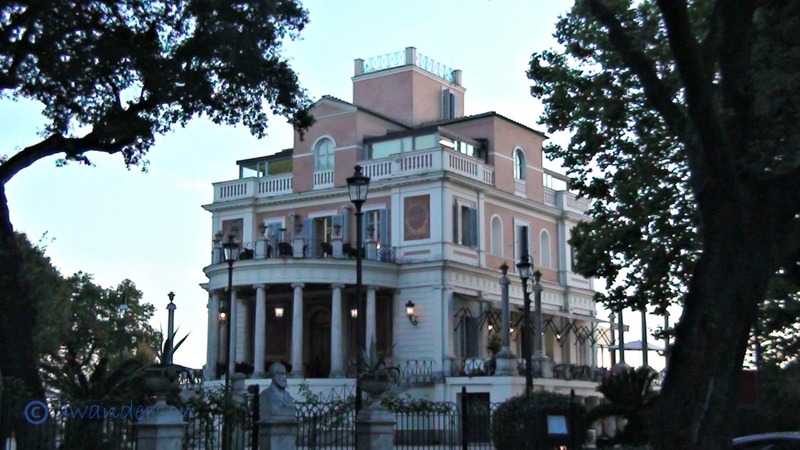 Many of the buildings are currently being used for museums art galleries and restaurants. 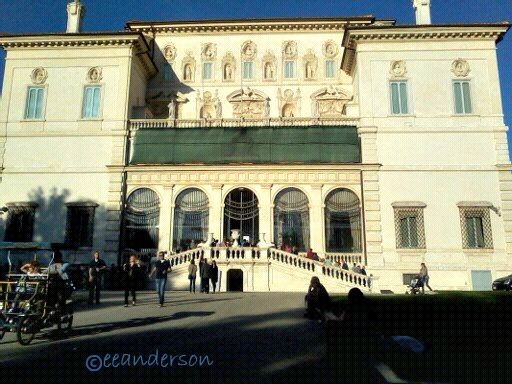 The main building is the villa Borghese it houses Galleria Borghese with magnificent works of art. If you go late in the day it is less crowded. Another nice thing is they only allow a small number of people in at a time so it is a much more pleasant experience than you may have at the larger art galleries in Rome. It is really worth a visit. There is also a lovely gift shop in the villa with a separate entrance. 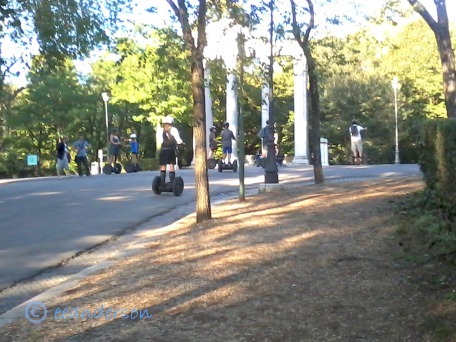 On this day we just walked, if you prefer there are several ways to get around in the park from Segway, bicycles for one, two or for family’s even a mini train. The park is vast and apparently there is even a zoo though I have never visited it. We stopped for a pleasant lunch at an outdoor café and rested. There is a variety of dining options scattered throughout the park. Sitting by the little lake it looked like a scene from a 19th century novel with couples paddling around in rented row boats with the sun sparkling on the water. 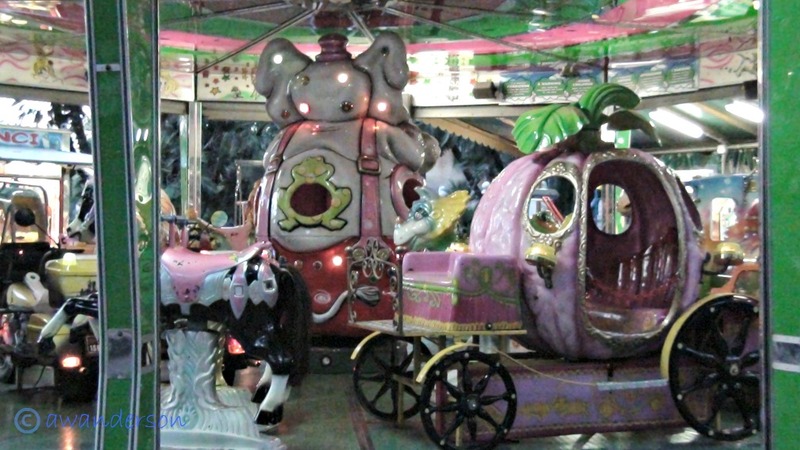 Further into the park we happened upon whimsical looking children’s merry go rounds. Actually I never saw many children in Rome, as they have a low birthrate; that is until we were in the park. It was filled with families out for the day. Lots of mothers with strollers. We even saw a private school with elegantly dressed parents driving very expensive vehicles like Mercedes dropping off the children. 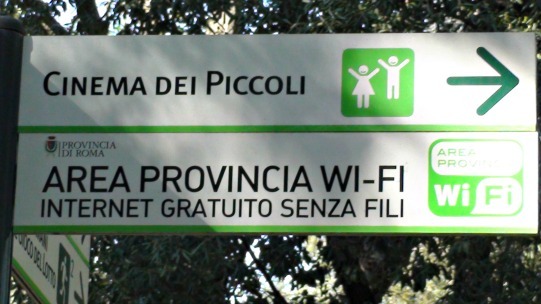 There is wireless available, and the access areas are noted like street signs. A large map is posted to help you navigate your way. 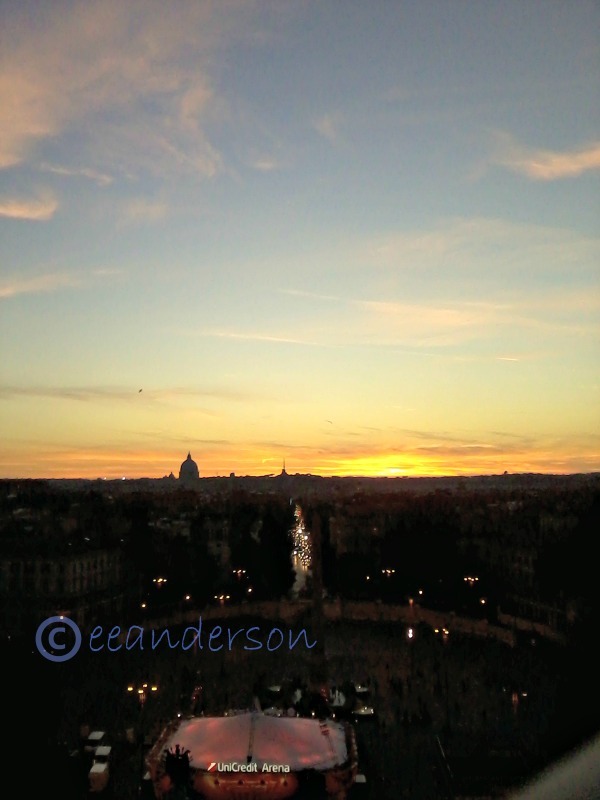 We were lucky to reach the area above the Spanish steps just in time for the sun setting. We were able to see the beautiful vistas to take pictures. 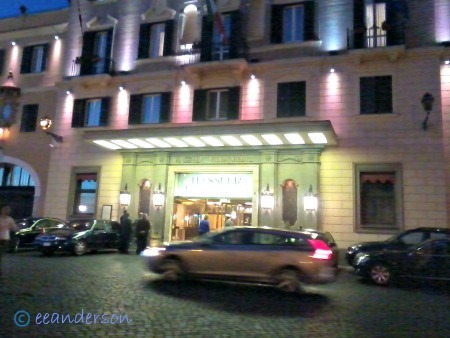 Then we headed to the area above the Spanish steps for an evening of window shopping along via Veneto with its very luxurious and fashionable boutiques, cafes, hotels and have something to eat and a rest with the crowds in the piazza below the bottom of the steps. It is crazy and filled with tourists so be careful of the gypsies as they hang out there trying to get your stuff. I am usually very careful, but alas even I lost my transitional glasses to them at the Spanish steps. I usually ignore them, however; they got me distracted by poking me with fake roses and the wire hurt. They pretended they wanted me to take one for free and just wouldn’t leave me alone. 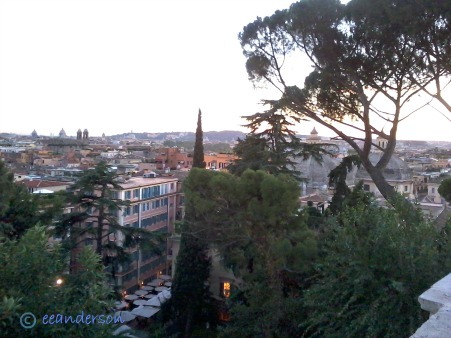 No matter-these things happen, I can only blame myself, and it was still one of our most pleasant days spent in Rome. 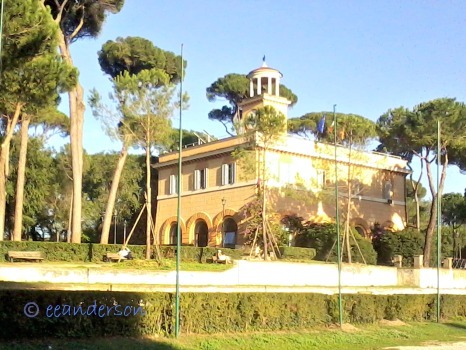 I highly recommend a visit to villa Borghese if you have a free day. 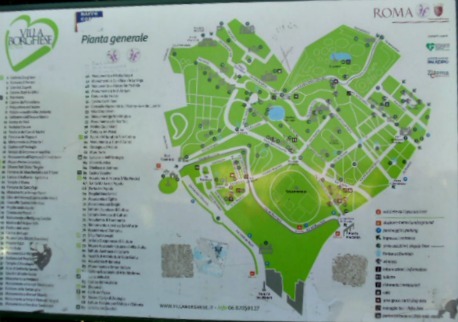 Note: The park itself is free (80) hectares but there is a charge for entrance to the art galleries, and museums. 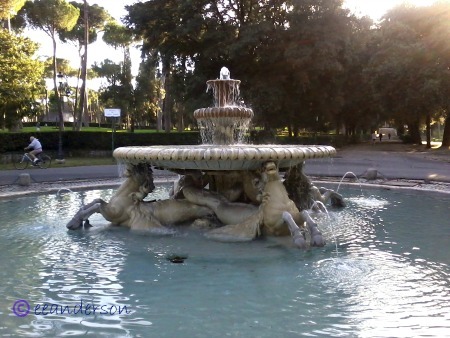 This entry was posted in Italy, physically challenged, Rome, Travel, Travel tips and tagged Galleria Borghese, Rome, Villa Borghese. Bookmark the permalink. Your welcome, I like reading posts that bring back nice travel memories also. When in Europe my favorite lunchtime routine is: buy a croissant or a baguette at a closet-size bakery, fruit from a sidewalk vendor, and a bit of cheese from a cheese shop or deli, and picnic in the nearest park. Saves a fortune on restaurant meals and it is fun to people watch and enjoy a little sunshine between museums, shops, and bus rides. Bon appetit! We are of like mind! I agree that it is a really nice way to save on the restaurant bills.